Whether you are tie dying your own unique homemade gifts or tie dying just for fun... these tie dye instructions will help you get the vibrant, high quality results you want. 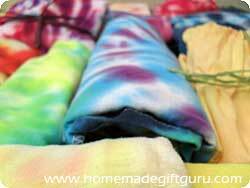 Learn more about using tie dye to create fun and unique homemade gifts here! Tie dye is easy... but everyone seems to have their own way of doing it and not all tie dye techniques are created equal. ...then you will like the following tried and true cold water tie dye instructions, including my best tie dye tips. 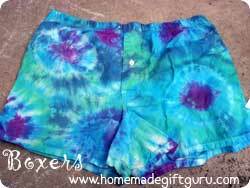 The following tie dye instructions and techniques use high quality cold water dye. The actual process of tie dying is very easy but you will get the best results by following these tie dye instructions especially, garment preparation, tie dying and washing instructions. Gather Garments. 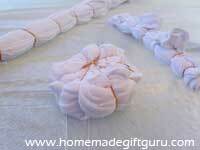 Choose white clothes or light colored clothing, 100% cotton, linen and rayon are best. While your fabrics soak, the next step in the tie dye instructions is to prepare your work space. Tip: It is a good idea to get all the folding and banding of your fabrics done before you even bring out the dye. It has a way of "getting around," and you'll like the peacefulness of knowing your work surface is 100% free of dye powder specks or dye drops of any kind. Squeeze Water From Fabric. Once fabric has been soaked, put on gloves and squeeze out excess water from fabric. Bind Fabric: Fold, twist, pleat and/or apply rubber bands as desired. There are many different tie dye patterns and techniques and like finger prints, no two tie dye projects will ever be exactly the same. 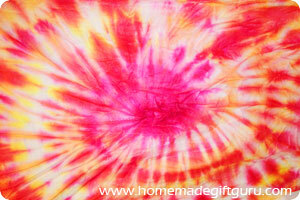 Below these tie dye instructions you will find specific ideas for creating the pattern you want. 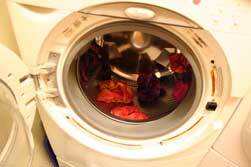 Tip: Clothes should be kept moist for tie dying. 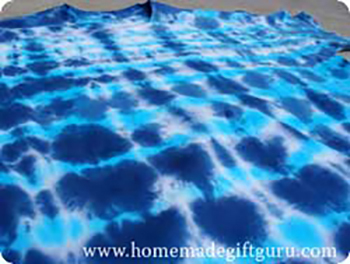 If you have several things to tie dye or if the weather is very hot, it may be necessary to keep your pre-soaked, now damp fabric covered with plastic (or right in a plastic bag) to keep fabric moist while waiting to be dyed. Prepare Dye. Follow instructions on dye for preparation. Procion MX dye requires 2 teaspoons of powdered dye to be added to 8 oz of water. 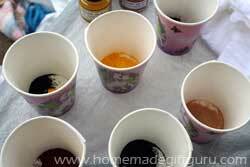 For lighter colors you can add more water if desired. 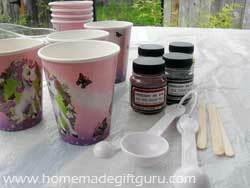 You can apply dye using a squeeze bottle to squeeze it where desired or by pouring it from a cup (such as the left over party cups as shown) onto desired area. Both work but squeeze bottles provide a little more control, plus they are easier to mix (simply shake well). Tie dying can be very messy! With that said, I have developed a pretty handy way of containing much of the mess. I use a plastic kitchen trash bag to both dye my fabrics in and to wrap them in (the wrapping keeps them damp while the dye sets). Get Bag Ready. Open the trash bag and push down the sides so the bottom of the bag is your work surface. Lay your bound fabric on that surface. Apply Dye. Squeeze or pour dye as desired. The tie dye technique in this step of our tie dye instructions may also be determined by the tie dye patterns and technique you choose below. The project shown is a Spiral Tie Dye T Shirt and we do have a step-by-step tie dye instruction tutorial for the rest of the project shown. 3. Gloves. With rubber gloves, it is surprisingly easy to take a damp paper towel or wash cloth and wipe dye splatters/smudges from the gloves. This will make it easy to use just one pair for your project, even if various colors will be used. Cover Project. You always want to keep the garments damp by covering in plastic. Some people use gallon sized zip lock bags or simply plastic wrap. In this case, you can enclose the fabric right in the plastic kitchen bag, pushing out any air and twisting the bag up securely. You may want to put your bagged projects together in an additional plastic kitchen trash bag (to be safe in case of a leak and to keep them all together). Let Set. Allow fabrics to sit undisturbed for 24 hours. 24 to 48 hours actually! This fabric "baking" time, as I like to think of it... (along with the soda ash soak and your high quality Procion dyes), will give you well set, vibrant colors (rather than the faded colors that some tie dye kits and dyes result in). Rinse. After the dye has set for at least 24 to 48 hours, it's time to rinse away excess dye. 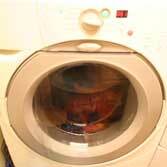 Wearing gloves, remove dye soaked fabric from plastic bag, discard plastic bag and rinse the fabric in warm water. Remove any rubber bands and start to untwist as you rinse. Continue rinsing until water runs nearly clear. You may notice that some fabrics as well as some colors take longer to rinse than others. It's just differences in dyes and fibers. When you're done rinsing each garment, put rinsed fabric on a clean plastic bag (or other plastic) and never let your various projects lay against each other at this stage, the dye will transfer at this point. Wash Fabric. The last step in these tie dye instructions will be to machine wash (or hand wash if necessary) fabric in hottest water suitable for fabric using Synthrapol. 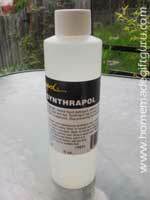 Synthrapol is an industrial strength neutral detergent that suspends the dye particles so they don't bleed back onto your fabrics. This is how you keep all your colors where you want them (white stays white and even bright colors keep to themselves). Another benefit of Synthrapol is that it allows you to wash different colored fabrics together without any dye transferring between fabrics (see the various tie dye projects being washed together above). Dry Fabrics. Machine or line dry as desired. That's it for these tie dye instructions... below you will find a few more tie dye tips you might find useful. To get the same effect on each side (such as identical striping on the ends of a scarf), fold fabric in half first before rolling or pleating and binding. Being Deliberate. 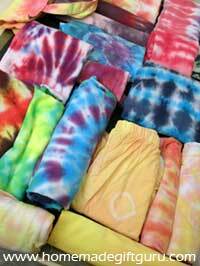 In addition to these tie dye instructions, you can choose to be deliberate about your tie dying style. A few examples... Start with the same color on both sides. Decide whether you want straps (when applicable) bound or not and do the same for both. Put complimentary colors next to each other. Plan colors ahead. Choose where you want your spiral to start and pinch from there... or your circles etc. For example, you might want a centered spiral or you might choose to have it start off centered to the side. Avoid mixing certain colors... mainly green and red. These colors combined make an unattractive muddy brown. Since purple has red in it, be careful mixing green and purple for the same reason. A great solution I've found for using purple, blue and green together (without muddiness between purple and green) is to start with the purple, squeeze the blue around the edges of all purple and fill in the rest with green. That way the green and purple will have a "padding" color between them... blue. Don't Mix the Rainbow. Also, try not to mix too many colors directly together, this can lead to muddy results. Whenever mixing colors or allowing colors to bleed together, think about what those two colors will create. -Many colors will just tinge each other... except red and green as mentioned above, they make a terrible brown... can you tell I've tried? No two tie dye projects will every be exactly the same!